LOVE is for the way I look at mushrooms, goat cheese, spinach, and light creamy-sauce-coated pasta with a generous crackle of pepper over the top. And luhhhhve is for the way I eat it all. ♡♡♡♡♡♡♡ <– just to make sure you’re getting where I’m going here. 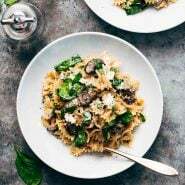 In order to really fill out the picture on this heavenly date night mushroom pasta with goat cheese, you need to know this about us: we are pretty traditional in our marriage/home owner roles. Bjork does outside stuff like shoveling snow and mowing the lawn, and I do the inside stuff like cooking and eating small bites of leftovers out of the fridge. You know, the important stuff. So I’m not even exaggerating when I say that when Bjork offered to make dinner a few nights ago, it moved his total of Husband-Cooked-Dinners in the lifetime of our marriage to a grand total of 3. One, two, three. We’ve been married for almost six years. OKAY THEN. “Date night,” we called it. And as it turns out, Bjork actually knows how to cook with the help of a few recipe tutorials, and I actually can and will shovel snow at neck-breaking speed (MY NECK THO), and most importantly: we both die for pasta with goat cheese and mushrooms. It’s only fair to name this recipe Date Night Mushroom Pasta in honor of how the recipe came into my life. AND because making and eating this just feels super romantic, maybe because of the white wine, or the earthy textures and colors, or the incredible smells that take over the kitchen when you toss the handful of garlic into the butter and wine, or probably just because I have unnaturally strong feelings of attraction towards melty hunks of goat cheese. Just let love into your life right now, okay? 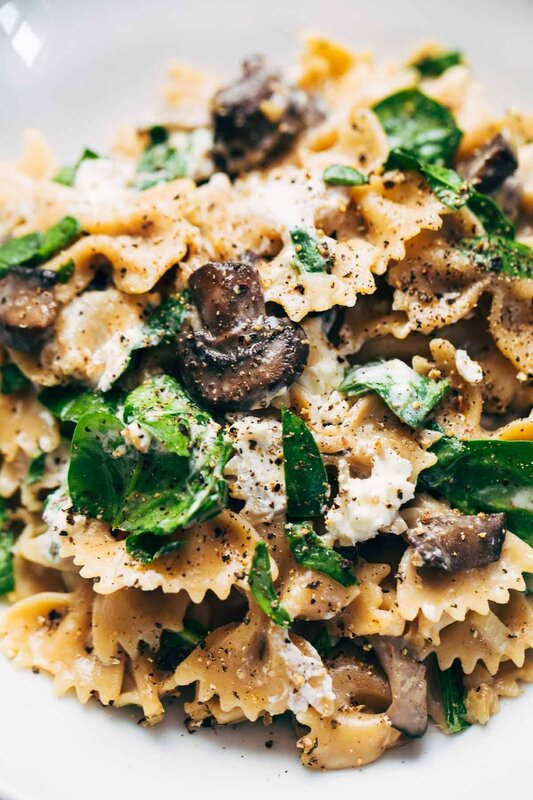 Date Night Mushroom Pasta with Goat Cheese – swimming in a white wine, garlic, and cream sauce. Perfect for a date night in! PASTA: Cook the pasta according to package directions. Drain and set aside. MUSHROOMS: Heat the butter and oil in a large skillet or pot over medium high heat. Add the mushrooms and saute until golden brown and soft, 5-10 minutes. The mushrooms will cook down and reduce in size. Add the garlic and white wine (it should sizzle a bit) and give it a few good stirs. Add the whipping cream and salt. TOSS: In a large pot, toss the pasta with the mushroom sauce from step two. Add some or all of the broth if you feel like you want there to be more sauciness (it sort of depends on personal preference – we had it with the added broth, and without, and it was good both times). SERVE: While the pasta is still warm, stir in the Parmesan cheese. Just before serving, stir in the spinach and goat cheese, or just top each serving with a few hunks of goat cheese. If he offered to make dinner, I think it would be eggs and toast…but I am totally going to show him this because..umm YUMMY. Wine and 2 kinds of cheese? SO IN. How very sweet of your husband! I bet you could get used to this! It would be pretty fun to see you guys reverse roles on POY for a week! Bjork in the kitchen and you buried deep in code! Just the thought of computer code sends shivers up my spine! It’s awesome how Bjork made dinner. We’re very traditional too, in a dorky kind of way and are happy with it. This pasta dish looks like something I’d totally order at a restaurant, and have you noticed, even pasta dishes are at least 15 bucks these days! So for my husband I to go out, order a drink, meal, appetizer and pay for a babysitter…….we’re looking at 100 bucks. Love the idea of eating this by the fireplace and just enjoying family time too, hey, date night can include the kids! Hahaha! Oh my gosh. It would be our demise. Obsessed with goat cheese. This looks to die for–it’s got all of my favourite things! haha – with our new super high powered range, I can’t tell you how many times we’ve had to scrub burned remnants of scrambled eggs out of pans because Bjork tries to cook them on high. Why do guys do this??? Always??? I love everything about this dish! Brilliant. My hubby is my grill master. I am the oven master and we love to share the in-between. 35 years and counting. Haha great story 😛 We’re kind of reversed on this at home, so maybe she’ll be making this for me soon 😉 I like the grungy-sort-of-style photography! That was so sweet of Bjork to cook dinner for you. My husband has a similar record, except his specialty is tacos. With the packets of flavor, haha. I love everything about this pasta and can imagine the flavor is very romantic. Butter and wine are the way to my heart! This looks great. And bonus, I’m pretty sure I have all the ingredients in my fridge right now! I know what I’m having for dinner tonight! Yum. I love pasta and the protein looks great too. My husband used to cook too and then realized my stuff just tasted better. 🙂 He does the dishes. Win. Win. That’s usually us. 🙂 It’s definitely a win-win. Hahaha! I would take it! All things I love….put together into one meal. Delish! Sounds like the perfect date night pasta. I love all these flavors together too and now craving a big bowl! HAHA Love the story cuz I can totally relate!! My husband has only cooked a few times and we have been married 8 years. Normally when he has tried to cook it created a huge mess and the ingredients were somewhat scary! But he tried, gotta love him for that. Ohhh…that looks mighty fine and fabulous! Can I have this now!? Looks so fresh and tasty. Annnd pasta for under 500 calories? I need this now. Date night with a glass of wine(or bottle) made easy! 😉 Thanks! 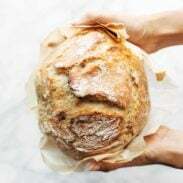 Thank you for the nice recipe. Have a Fun Day! This pasta looks like it’s leaping off the screen!! So delicious looking and PERFECT for date night! Aww-that’s just so sweet Bjork made you a date night dinner – so much love goes into cooking a meal -even if its a simple one! This sounds fantastic! Waitttt, weren’t you a mushroom hater just a few months ago! Welcome to the delicious side! I WAS! But I have overcome. You have absolutely no idea how much I love you right now!! I just got my guy to try goat cheese, and he loves it!! So I have been looking for every and anyway to cram it into our menus. This will be happening at my house ASAP!! Although I will have to make him a steak on the side because he is one of those “There has to be meat for it to be a meal” kind of guys. Ppfffttttt pasta, mushroms, and goat cheese is good enough for me! 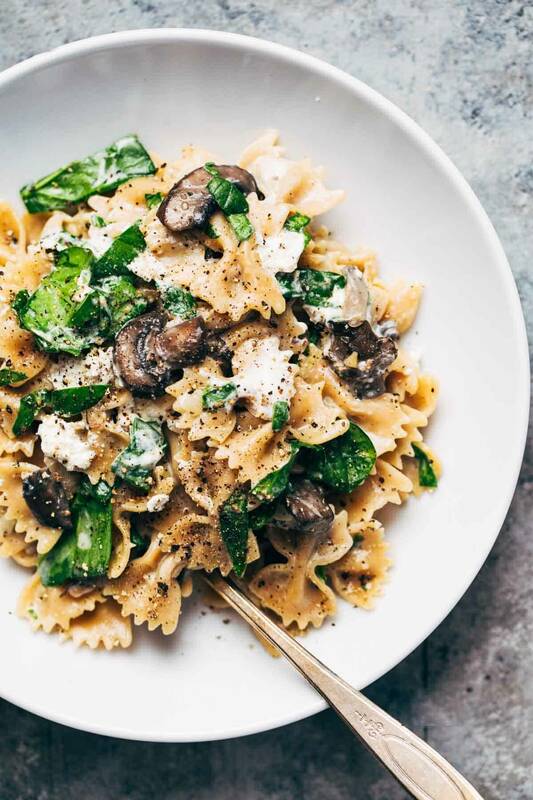 Goat cheese, mushroom, and pasta – all my faves in one dish! Must pin!